Today I am going to post my husband’s favourite muffin/cupcake recipe. I always bake something for him on the weekend and this recipe is the one that he asks for. I found this recipe in my sister-in-law’s book called ‘The Golden book of chocolate’. Since then, I have made them many times. Preheat the oven to 190°C/gas 5 (375°F). Arrange 20 baking cups on baking sheets. Mix both flours, baking powder, baking soda, and salt in a large bowl. With mixer at low speed, beat in the bananas, followed by the mixed dry ingredients, alternating with the milk. Scoop the batter into the cups, filling each about two-thirds full. Bake until a toothpick inserted into the centre comes out clean, 20-25 min. This entry was posted in Recipes and tagged Banana, Chocolate, Cupcake, Walnuts by clarissaskitchen. Bookmark the permalink. 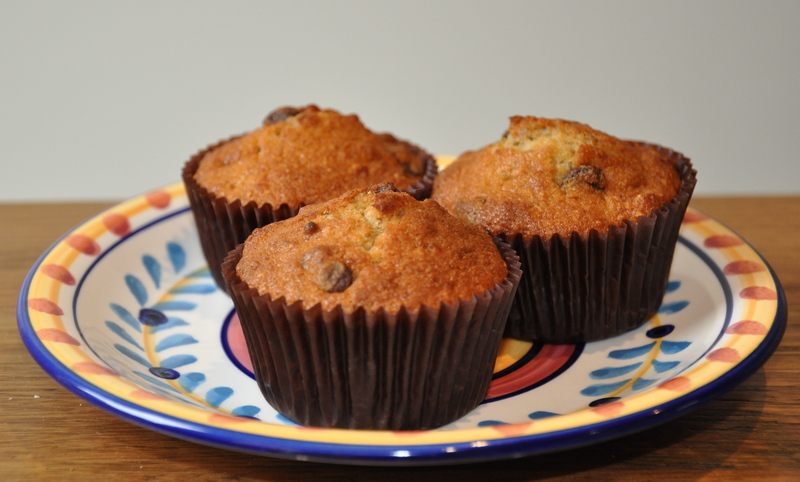 These are definately my favourite muffins – they are delicious! Love the chunks of chocolate and nuts and eating them on drive down to Cape Schank to play golf on a Saturday. sono contenta per voi cugino! la pace! Primaaaa divulgue mais seu blog que esta arrasando! !